Sergeant Friday’s job involves fact finding. Here’s an episode of Blognet that first ran four years ago today. MUSIC: Theme. Intro and fade under. NARRATOR: Ladies and gentlemen, the story you are about to hear is true. The names have been changed to protect the innocent. NARRATOR: You’re a Detective Sergeant. You’re assigned to Internet Detail. Bloggers are being harassed by a convicted terrorist who is suing them for writing about his past. Nothing they’ve written appears to be false, but there is a gap in the terrorists bio. Your job … investigate. ANNOUNCER: Blognet … the documented drama of an actual case. For the next few minutes, in cooperation with the Twitter Town Sheriff’s Department, you will travel step by step on the side of the good guys through an actual case transcribed from official files. 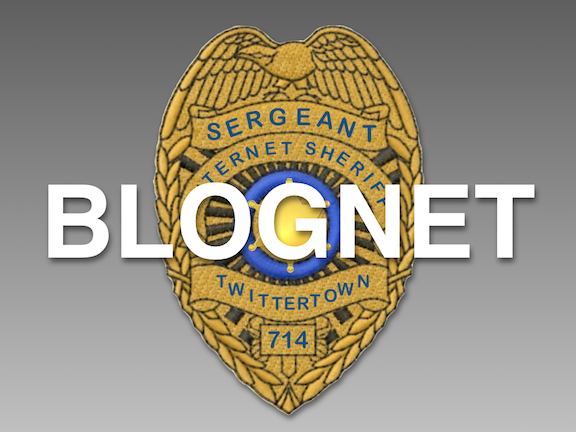 From beginning to end, from crime to punishment, Blognet is the story of the good guys in action. FRIDAY: It was Wednesday, May 23rd. It was a warm spring day in Westminster. We were working the day watch out of Internet Detail. My partner’s Liz Smith. The Boss is Twitter Town Sheriff W. J. J. Hoge. My name’s Friday. It was 12:32 pm when we returned from lunch to Room S-140. Internet Detail. SOUND: Door opens. Footsteps across room. SMITH: So it looks as if there’s going to be substantial participation in that blogburst on Friday. SMITH: I can’t believe that judge said that he would ignore a Supreme Court precedent. FRIDAY: It’ll get overturned on appeal, but, yeah, that gag order is blatantly unconstitutional. Meanwhile, the Boss wants us to dig up more background on this Timberland fellow. SMITH: Well, we’ve got a pretty good record up to the turn of the century. His crimes in Texas and Indiana are reasonably well documented in the biography that Mark Songbird wrote, and his time in prison after his parole was revoked is covered by all those lawsuits. FRIDAY: Yeah. My favorite is the one where he sued because the Bureau of Prisons wouldn’t let him have an electric guitar. SMITH: I guess it’s time to exercise our google-fu. FRIDAY: You handle that. I’ll get down to some of the courthouses to check the paper records that aren’t online. Be careful. FRIDAY: Given the level of BS on everything related to Timberland, you’ll want to wash you hands after handling the data. FRIDAY: I made a tour of all the relevant courthouses in Maryland and had a colleague check in New York. Except for some traffic tickets and a civil case about an unpaid bill, there was nothing to be found with Timberland’s name on it. Friday, May 25th. The blogburst about Timberland went off with several hundred blogs participating. Monday, May 28th. Liz and I rotated to the evening watch. Thursday, May 31st, 8:49 pm. SMITH: Hey, Joe! Look at this. SMITH: It looks like the blogger Timberland has been after got SWATted. FRIDAY: Uh, huh. And on the same day that the unconstitutional gag order was overturned. What a coincidence! By the way, how’s that research on Timberland going. SMITH: There’s a surprisingly small digital footprint, at least under his own name. There are a lot of apparent sock puppets. He appears to have a couple on Twitter, and he has had several through the years on Internet forums such as Leftwing Underground. FRIDAY: But there’s no record of the suit. Even if it were sealed, the case caption and case number would be on record. And his Parole Commission records show that he’s off supervised parole, but his sentence isn’t up until sometime in 2030. FRIDAY: Again, there’s no record of any such lawsuits. SMITH: Yeah, but what’s particularly stupid about the claim is that Songbird published a couple of books in 2004 and 2005 that sold well. Those are easy facts to check. It took me under a minute on Google. FRIDAY: Uh, huh. I read one of those books, but Timberland wouldn’t have liked it. FRIDAY: It was a book about unusual stories from around America. One of the chapters was about the execution of the Oklahoma City bomber. NARRATOR: On July 5th, an appeal trial was held in the Circuit Court of Maryland for Montgomery County on the peace order Timberland had obtained against the blogger. In a moment, the result of that trial. ANNOUNCER: Spring has sprung, but we’ll still have some chilly weather for a few more weeks. A Team Lickspittle hoodie could be just the thing to keep you comfortable on one of those not-too-cold days ahead. It’s exclusively available along with lots of other goodies at The Hogewash Store. Stop by today and spend some of your hard earned cash in support of Team Lickspittle. Or do your Amazon shopping via the link on the Home page. Or hit the Tip Jar. They’re all ways you can support the Team. NARRATOR: On July 5th, an appeal trial was held in the Circuit Court on the peace order Timberland had obtained in the District Court. The court found that Timberland was unable to produce evidence to support any statutory basis for a peace order. Accordingly, the peace order petition was denied. ANNOUNCER: You have just heard Blognet, a series of authentic cases from official files. Technical advice comes from the office of the Twitter Town Sheriff’s Department. ANNOUNCER: Blognet is a work of fiction. Anyone who thinks it’s about him should read Proverbs 28:1. This is LBS, the Lickspittle Broadcasting System. The Facts are not Team Kimberlin’s friends. This entry was posted in Blogging, Crime, First Amendment, Lawfare, Shameless Commerce, Team Kimberlin, Trolls and tagged Blognet by wjjhoge. Bookmark the permalink.